We got some great buzz on the release of our research into the confidence of U.S. business editors and reporters. Almost two-thirds of business journalists report that the amount of business coverage at their organization has stayed the same or increased in the past five years, according to a new survey commissioned by the Donald W. Reynolds National Center for Business Journalism. The results were far more optimistic than we anticipated. And they suggested that newsrooms, at least the business desks, are not as gloomy as journalists have been suggesting. • Six out of 10 are doing more or about the same level of investigative journalism. • Nine out of 10 have learned new skills. • Three-fourths say their workload has increased and they use social media. • About half blog, file first for the Web and cover more beats. 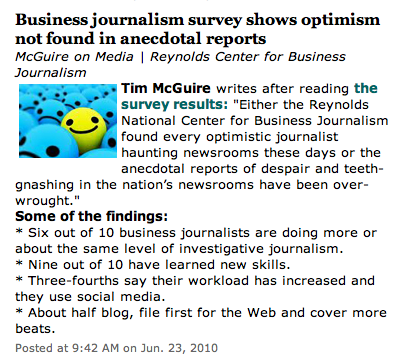 Survey: Business Journalists Are .. Optimistic? It was a lot of fun to put together this package. The report, five quick questions answered by Reynolds President Andrew Leckey, a slideshow of the Q&As, and an analysis from journalism professor Tim McGuire. This entry was posted in BizJ. Bookmark the permalink.